Online Conferences for us! » Psychological Empowerment! Did you know you don’t have to be applying for the scholarship to be part of the Do Change Campaign? It’s true! Check out the campaigns instructional video via this url http://www.holisticnutritionlab.com/dochange/. After that video starts go to 30 seconds into the campaign video. Then you’ll be instructed in how to part take even if you never took the Digestive Intensive course. The DO Change campaign video is nearly 2 minutes long. Are you an NT (Neuro-typical) stressed to unhealthy levels caused at least possibly in part to others with Special needs? If you are, Your NOT Alone. In fact, yesterday was the Day of Mourning for the deaths of those with Special needs caused buy caregivers who mostly killed them due to ridiculous amounts of stress. While, this Summit is certainly not only for Special need parents/caregivers. If you think typically, and are wired negatively. Tapping is one positive way to relieve stress! And you should defiantly check this out if your ready to change that reality! It already began but Day 1 due to technology difficulties is still available once you opt in as an attendee via this sign up page shared below. Here is Trudy Scott’s initial e-mail to me about this Best seller’s summit! I slightly edited it too. Buy the way, Julie Matthew’s, finds this her favorite method to reduce Stress for herself. And teaches sp. needs parents how to do it too! 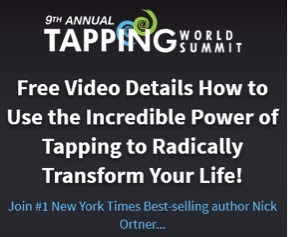 This is a quick reminder about the 9th Annual Tapping World Summit, which starts tomorrow February 27th. Are you holding on to stress and are you aware that it can be affecting your body, mind and spirit in dramatic ways. PS. 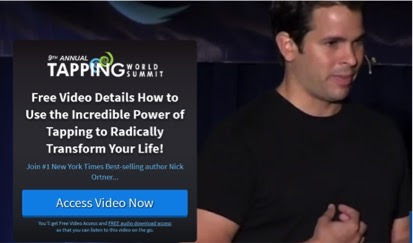 Nick is releasing this video as part of the lead up to his 9th Annual Tapping World Summit, which started February 27th. This event has been attended by over 2 million people over the last 8 years. It is a truly life-transforming event that you don’t want to miss out on. PPS. Share this with someone you love who you know is also dealing with a lot of stress right now. Your thoughtfulness in thinking about them for just 10 seconds might just change their life! Jim Kwik, is a memory coach and the host of this weekends, LIVE Superhero You Brainpower Conference in Los Angeles, CA. Doctor Amen whom I’ve posted previously about who is an ADHD expert, ( And who works in other brain science areas) is only 1 of over 30 speaker’s you can hear LIVE for free ONLINE. There will even be a speaker who has synesthesia. A rare sensory processing disorder! Those who aren’t online spent/ will be spending thousands including travel and lodging expenses to go in person to this. I’d check this out today. And sign up if your at all curious about it. Listening to speakers certainly won’t cure you. But, if you take action on what you learn from them. It might make your life easier, sooner. And most of the speakers are likely going to be new to many of you. Folks with LD and ADHD may benefit more from some of the talks then someone with just autism would. And Mindfulness is not MY FAVORITE stress relief practice. And if you know others who might benefit from it and are available this weekend. Please send them to this post/ link. Feel free to share what you think of it after in the comment section below. State which speakers you heard and really liked also. And click become A Member on the top right hand side of the above Link. After hearing his short audio message. Then after signing up, he’ll send you an invite to watch him live with a LIVE Q and A on May 6. Because Nick is so unique. You may need to be patient in his communication style. But, I assure you, he appreciates all who sign up. And Nick Vujicic is going LIVE for Free! When? May 7th at 9 am PDT time or 12 pm EDT. This is totally worth missing work for if you can get to him live. But, if you can’t (It’s in CA) it’s totally worth taking at least a work break for. Why? Did you see my latest point on disabilityadvocate1. com and the short utube video on his story? You really need to see it all. Then come back here. And then watch the video at this next url utube video. Need more inspiration? utube his name. You’ll get plenty. Or wait for my next post on here.